It's a delight to welcome Bliss Bennet, on her search for a particular illustration! I don’t know about you, but I’m not a big fan of thrill rides. Whenever I visit a fair or an amusement park, it’s not the roller coasters with the most inversions or water slides with the steepest drops that catch my eye. No, it’s the friendly, colorful, and soothing carousels that draw me, bringing me back to my childhood, my mother’s arm safely holding me atop a beautiful prancing horse. 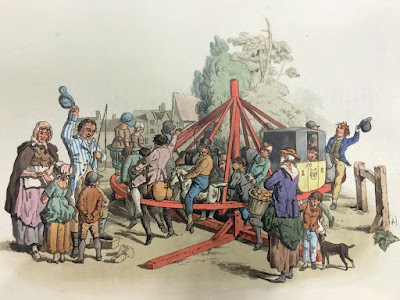 So when I was researching a fair scene for my latest Regency-set historical romance, A Lady without a Lord, I was delighted to discover this black and white drawing of what appears to be an early version of a merry-go-round, or a “round-about,” on the “Regency Illustrations” page of The Republic of Pemberly web site (http://www.pemberley.com/janeinfo/rgnclfil.html). Detail-oriented person that I am, I needed to know precisely when, and from what source, this illustration was taken. So I began to do a little digging. A web search for W. H. Pyne led me to the National Dictionary of Biography, which told me that Pyne was one William Henry Pyne, an English illustrator, painter, and writer who worked extensively on book projects with Rudolph Ackermann of Ackermann’s Repository Fame. 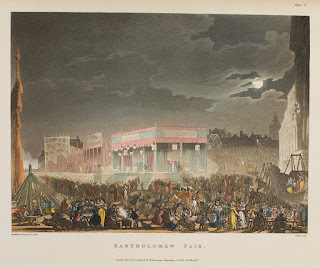 Given the date listed in the caption, and comparing it to Pyne’s list of published books, I guessed that the print might be from a volume of The Microcosm of London; or, London in Miniature, which Ackermann published in three volumes from 1808 to 1810. 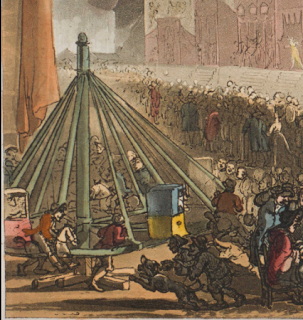 Each chapter in this lavish guide describes a different major site in the English metropolis, from “Academy, Royal” to “Workhouse.” Volume one, which is available online through the Internet Archive (https://archive.org/details/b22007076_0001), includes a chapter on Bartholomew Fair, and describes a print that includes a roundabout. Had I found my source? The online book did not reproduce the accompanying prints, alas, so I couldn’t be sure. A little more searching revealed that while Pyne had written the descriptive texts that went along with the plates in The Microcosm, the actual prints were created by two other artists: architectural draughtsman Auguste Charles Pugh and comic artist Thomas Rowlandson. But the caption of the original piece said it was by Pyne, not just from one of Pyne’s books. So perhaps this wasn’t the right source after all? More searching led me to Mathew Sangster’s web site Romantic London(http://www.romanticlondon.org/), a fascinating research project which “considers the ways in which the writers and works later grouped under the umbrella of Romanticism interacted with London’s communities and institutions while also examining a wide range of alternative approaches to representing and organising urban existence.” One of the texts that Sangster draws upon for his project is Pyne’s Microcosm. And his web site reproduces the prints from all three volumes! 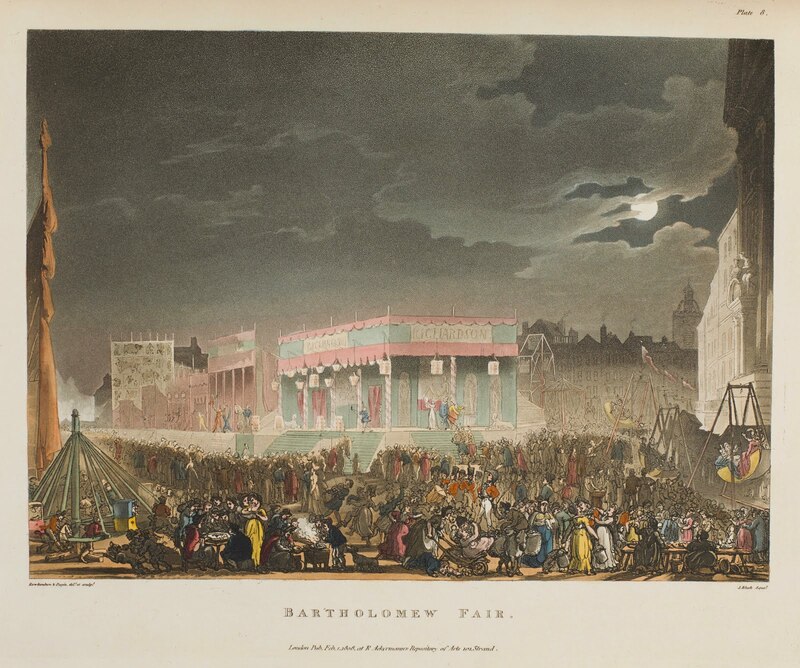 A quick look at the print for the Bartholomew Fair chapter showed me that it was not, in fact, the same print I was looking for. But it did confirm that roundabouts of the same type existed at this time; if you look closely at the bottom left-hand corner, you can see a small merry-go-round with happy riders on board. Where, then, had my original black and white illustration come from? My next step was to consult with the owner of The Republic of Pemberly web site, my colleague and fellow romance writer Myretta Robens (http://myrettarobens.com/), to see if she remembered anything about the illustration. She told me that most of the images on that page of the site had been contributed by a graduate student who had been working on a dissertation at the University of Texas at Austin at the time. A quick hop over to the UT Library’s catalog told me which books by W.H. Pyne were held by the library, which narrowed down my search considerably. I began to look at online descriptions (and occasionally actual copies) of each of those titles. That search, in turn, led me to the web site for The Keep (http://www.thekeep.info/), an archive in Sussex, England that provides access to historical materials from the East Sussex Record Office, the Royal Pavilion & Museums Local History Collections, and the Special Collections of the University of Sussex. A page on the site by Jo Baines, “Fashion in the Archives: Baker Rare Books Collection—W. H. Pyne and The Costume of Great Britain,” features several color prints from Pyne’s 1804 book, The Costume of Great Britain—including a color rendering of the same black and white drawing with which I began my search. I had finally found my source! When all was said and done (and written), the round-about didn’t end up playing much of a role in A Lady without a Lord. But after all that research, I simply had to include a brief mention of it during the village fair scene. Have you ever come across an illustration or work of art on the web that included no source information, or the wrong source? How did you go about finding its origins? 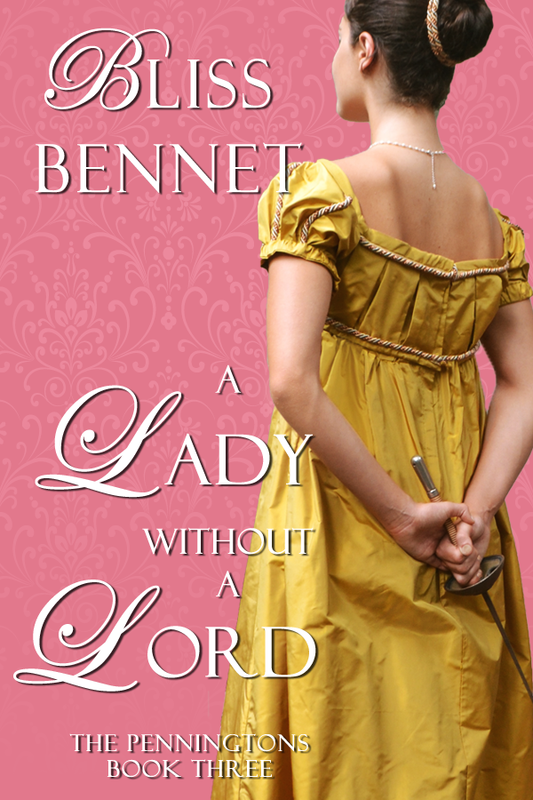 Bliss Bennet writes smart, edgy novels for readers who love history as much as they love romance. Her Regency-set historical romance series, The Penningtons, has been praised by the Historical Novel Society’s Indie Reviews as “a series well worth following”; her books have been described by USA Today as “savvy, sensual, and engrossing,” by Heroes and Heartbreakers as “captivating,” and by The Reading Wench as having “everything you want in a great historical romance.” Her latest book is A Lady without a Lord. Interestingly, my "hero" John Joseph Merlin seems to have exhibited an aerial carousel, probably with a musical accompaniment, at his Museum in London. He also developed boat-like swings, which were in use at Bath's Sydney Gardens. I gather that the carousels actually have a rather longer history, dating back to the Crusades. Merry Go Round devices were used as a training machine for knights in battle. They would sit on wooden planks laid out in a circle, suspended from a post in the middle of the ring. As they were spun round and round they had to try and hit a target with their lance - presumably as training for when they were jousting. In time their seats were adorned with horses heads - and we end up not with a military tradition but a piece of fairground entertainment. Fascinating, Mike! I'm familiar with tilting at a quintain, either on a horse or on a wooden horse pulled by others, but this would make training a lot of people at once much easier, where a knight has several squires say. Presumably also powered by the ones who lost at the various games of choices pushing like mad as with more recent ones. Not, however, in medieval times, the time-honoured schoolyard choice-game of 'spuds' lol. they were banned sometime between my childhood and my son's, as 'unsafe' rather like the banning of skipping and playing conkers because there is paranoia about health and safety and risk-taking is verboten.